[No more guilt] Treat yourself to goodies and good nutrition with our complete prenatal meal plan and tasty recipes. You’re pregnant and eating for two, right? That means your need for good nutrition is at an all-time high. But you can also make room for indulgences, even on a daily basis. Granted, you’ll still have to make sure you get all the nutrients you and your baby need, but if you play your nutritional cards right, you can have your cake (or a hot-fudge sundae) and eat it, too. How’s that for a treat? We’ve done all the thinking for you. Here’s a five-day meal plan (plus five scrumptious recipes) that meets your nutritional needs and has daily splurges built right in — from that hot-fudge sundae to a juicy hamburger. We’ve also included everything you need to know about pregnancy nutrition. So indulge and enjoy! >>> meal plan Nourishing your body and soul requires more than a perfect diet; sometimes it means indulging your cravings. The trick is striking a healthy balance between getting the nutrients you need and eating what you want. Our five-day meal plan shows you how. Recipes follow for foods marked with an asterisk (*). During your second and third trimesters, include the additional snack listed at the end of each day. Bon appétit! day 1Breakfast 2 eggs, scrambled using nonstick cooking spray, salt and pepper 2 slices whole-wheat toast topped with 2 teaspoons jam 1 tomato, sliced 1 cup freshly squeezed orange juice Snack 1 cup nonfat plain yogurt mixed with 1tablespoon apricot jam and 3 canned apricot halves, chopped Lunch 1 Fresh Herb Crab Cake* 1 slice bread with 1 teaspoon butter 1 orange Herbal iced tea (caffeine-free) Snack 4 orange-essence-flavored pitted prunes 2 Hershey’s Kisses 1 cup warmed milk flavored with almond extract and nutmeg Dinner Spicy Ginger Salmon: Blend 2 tablespoons each chopped cilantro and hoisin sauce; 2 teaspoons minced fresh ginger; 1 teaspoon canned, chopped chipotle peppers; and a dash of lemon juice. Rub on both sides of a 5-ounce salmon fillet. Broil about 6 minutes per side. First-trimester nutritional information: 2,216 calories, 30 percent fat (75 grams), 50 percent carbohydrate, 20 percent protein, 25 grams fiber, 14 milligrams iron, 1,435 milligrams calcium, 746 micrograms folate. Second- and third-trimester nutritional information: 2,505 calories, 31 percent fat (88 grams), 50 percent carbohydrate, 19 percent protein, 27 grams fiber, 16 milligrams iron, 1,621 milligrams calcium, 758 micrograms folate. day 2Breakfast Pancake Roll-Up: 1 8-inch pancake made with low-fat pancake mix, 1 egg and 1 tablespoon each wheat germ and nonfat milk, cooked according to package directions. Place 1 sliced banana along middle of pancake and roll into a “burrito.” Top with 4 tablespoons apricot sauce and 2 tablespoons light whipped cream. 1 cup nonfat hot cocoa Snack 1 cup frozen blueberries, thawed 1 cup nonfat milk Lunch Peanut Butter Candy Sandwich: Mix 2 tablespoons peanut butter, 1tablespoon honey and 2 tablespoons toasted wheat germ. Spread between 2 slices whole-wheat bread. 1/2 papaya drizzled with lime juice 15 baby carrots Root Beer Float: 8 ounces root beer and 1/2 cup vanilla ice cream Snack 1 6-ounce strawberry-kiwi low-fat yogurt mixed with 1 chopped kiwi 1 diet soda Dinner Rosemary Roasted Chicken* 11/2 cups steamed broccoli Caesar Salad: 10 inner romaine lettuce leaves sprinkled with 1 ounce grated Parmesan cheese, 2 tablespoons low-calorie Caesar dressing and freshly ground black pepper Second- and third-trimester snack Trail Mix: Mix 2 tablespoons dry-roasted cashews, 3 tablespoons semisweet chocolate chips and 2 tablespoons raisins. First-trimester nutritional information: 2,196 calories; 27 percent fat (67 grams), 55 percent carbohydrate, 18 percent protein, 36 grams fiber, 13 milligrams iron 1,740 milligrams calcium, 608 micrograms folate. Second- and third-trimester nutritional information: 2,508 calories, 29 percent fat (82 grams), 55 percent carbohydrate, 16 percent protein, 40 grams fiber, 16 milligrams iron, 1,768 milligrams calcium, 622 micrograms folate. Dinner Linguini With Clams: 9 ounces fresh linguini cooked until barely tender (2–3 minutes). Sauce: Sauté 4 minced garlic cloves in 2 tablespoons butter. Add 2 6 1/2-ounce cans minced clams and 1 6-ounce bottle clam juice. Add 1/4 cup chopped parsley and white pepper to taste. Top drained pasta with sauce and sprinkle with 1/2 cup low-fat Parmesan cheese. (Makes 4 1 1/2 cup servings.) 1 cup steamed peas and carrots 2 cups coleslaw made with 2 cups shredded cabbage and 2 tablespoons coleslaw dressing 1 Creamy Cheesecake* Second- and third-trimester snack Pastrami Sandwich: 1 1/2 ounces pastrami, 2 slices rye bread, 1 teaspoon mustard and lettuce (optional) First-trimester nutritional information: 2,206 calories, 24 percent fat (60 grams), 54 percent carbohydrate, 22 percent protein, 27 grams fiber, 39 milligrams iron, 1,300 milligrams calcium, 527 micrograms folate. Second- and third-trimester nutritional information: 2,514 calories, 27 percent fat (76 grams), 52 percent carbohydrate, 21 percent protein, 29 grams fiber, 41 milligrams iron, 1,325 milligrams calcium, 547 micrograms folate. day 4Breakfast French Toast With Fresh Strawberry Sauce* 3/4 cup honeydew melon, cubed 1 cup steamed nonfat milk flavored with nutmeg and 1/2 teaspoon vanilla extract Snack 1 ounce peanut brittle Herbal iced tea (caffeine-free) Lunch Egg Salad Sandwich: 1 large egg boiled and chopped, mixed with 1 tablespoon fat-free mayonnaise, 1 tablespoon diced celery, 1/2 teaspoon Dijon mustard (optional), salt and pepper to taste 2 lettuce leaves 2 slices whole-wheat bread 1 ounce potato chips 1 apple, sliced and sprinkled with 1/2 teaspoon cinnamon sugar Snack 1 cup grapes 1 cup nonfat milk Dinner Hamburger: 4-ounce extra-lean ground beef patty, grilled or broiled; 1 tomato slice; 2 lettuce leaves; 1 slice red onion; ketchup and mustard to taste on a whole-grain hamburger bun Sweet Potato Fries: Cut 1 sweet potato into wedges, season with salt and place on a cookie sheet coated with nonstick cooking spray. Bake at 425º F until slightly crispy (about 25 minutes). Spinach Salad: Combine 2 cups spinach leaves, 1 tablespoon sliced red onion, 1/4 cup raspberries and 2 tablespoons fat-free raspberry vinaigrette dressing. Chocolate Milkshake: 2/3 cup milk, 1/3 cup vanilla ice cream and 1 1/2 tablespoons chocolate syrup, blended Second- and third-trimester snack Add 1 ounce peanut brittle to morning snack; add nine small pieces California Roll sushi to mid-afternoon snack. First-trimester nutritional information: 2,206 calories; 26 percent fat (64 grams), 57 percent carbohydrate, 17 percent protein, 28 grams fiber, 18 milligrams iron, 1,373 milligrams calcium, 545 micrograms folate. Second- and third-trimester nutritional information: 2,503 calories, 26 percent fat (73 grams), 58 percent carbohydrate, 16 percent protein, 30 grams fiber, 20 milligrams iron, 1,398 milligrams calcium, 587 micrograms folate. day 5Breakfast Sunrise Smoothie: In a blender, whip 1/2 cup nonfat plain yogurt, 2 tablespoons orange juice concentrate, 1 banana, 4 apricot halves, 2 tablespoons wheat germ and 1/2 teaspoon lemon peel. Snack 1 peanut granola bar 2 1/2 tablespoons raisins Lunch BLT Deluxe: 3 slices crisp bacon; 1tomato, sliced; 2 lettuce leaves; 1tablespoon low-calorie mayonnaise on 2 slices whole-wheat toast Fruit Salad: Combine 1/2 orange, peeled and sectioned; 1 kiwi, peeled and sliced; 1/2 cup strawberries, sliced; 1/4 cup papaya slices; 1 teaspoon lemon juice; 1/2 teaspoon grated lemon peel. Mexican Hot Chocolate: Combine 1 cup warmed nonfat milk, 3 teaspoons unsweetened cocoa, 4 teaspoons sugar, 1/4 teaspoon ground cinnamon and 1/2 teaspoon vanilla extract Snack 1/2 cup berry sorbet with 1/4 cup raspberries Dinner 2 cups tomato soup made with low-fat milk (prepared per directions on can) Grilled Cheese Sandwich: 1 ounce sliced cheddar cheese and 1/2 medium tomato, sliced, on 2 slices whole-wheat bread. Coat a frying pan with nonstick cooking spray and grill until bread is toasted and cheese is melted. Raw Vegetable Platter: 1/2 cup broccoli florets, 1/3 cup cauliflower florets, 10 baby carrots and 1/2 cup fresh green beans slightly steamed but still crisp, dipped in 1/3 cup fat-free sour cream-based dip 1 Chocolate-Orange Brownie* Second- and third-trimester snack Decaffeinated Cappuccino Coffee Drink: 3 ounces decaffeinated espresso, 3/4 cup whole milk, 2 tablespoons sweetened cocoa powder and 1/2 ounce chocolate shavings First-trimester nutritional information: 2,193 calories; 23 percent fat (57 grams), 62 percent carbohydrate, 15 percent protein, 39 grams fiber, 18 milligrams iron, 1,540 milligrams calcium, 503 micrograms folate. Second- and third-trimester nutritional information: 2,495 calories, 24 percent fat (67 grams), 62 percent carbohydrate, 14 percent protein, 42 grams fiber, 20 milligrams iron, 1,776 milligrams calcium, 516 micrograms folate. Place crab in a colander and let drain for 15 minutes, pressing meat gently with a wooden spoon. (The crabmeat should be free of excess water but not dry.) Transfer to a large bowl; add next 7 ingredients. Using your hands, gently blend. Form into 8 2-inch round cakes. Spread bread crumbs over a dinner plate and gently press each cake into the crumbs, coating all sides. Place on a sheet of waxed paper and refrigerate for 15 minutes. Heat canola oil in a large nonstick skillet over medium heat. Cook crab cakes for 2 minutes on each side or until brown. Transfer to a paper towel to drain. To serve, place equal portions of the greens on 4 dinner plates, top each with 2 crab cakes and garnish with a lemon wedge. Nutritional information per serving (2 crab cakes and 3/4 cup greens): 236 calories, 39 percent fat (10 grams), 14 percent carbohydrate, 47 percent protein, 1.5 grams fiber, 2 milligrams iron, 112 milligrams calcium, 109 micrograms folate. Preheat oven to 450º F. Place chicken skin-side up in a roasting pan, tuck a sprig of rosemary under each skin and sprinkle tops with salt and pepper. Place in oven on center rack. Place potatoes and carrots in a small, shallow roasting pan, drizzle with olive oil and sprinkle with salt and pepper to taste. After chicken has cooked for 10 minutes, place the vegetables in the oven alongside it. Cook chicken and vegetables for 25 minutes, then remove from the oven. Remove rosemary sprigs and skin. Serve chicken with vegetables. Nutritional information per serving (1 chicken breast and 1/4 cup potatoes and carrots): 338 calories, 43 percent fat (16 grams), 19 percent carbohydrate, 38 percent protein, 3 grams fiber, 2 milligrams iron, 42 milligrams calcium, 32 micrograms folate. Allow bread to dry out the day before making this dish; if bread is soft, it will absorb too much of the egg mixture and be soggy. For the sauce, puree strawberries in a food processor or blender until smooth. Transfer to a small sauce pan, add lemon juice and 1/4 cup sugar and bring to a boil. Reduce heat slightly and cook until sauce begins to thicken, about 10 minutes. Remove from heat and skim off foam. Pour sauce into a small pitcher or creamer. In a mixing bowl, whisk together eggs, milk, vanilla extract and remaining teaspoon of sugar until smooth. Place bread slices in a shallow pan large enough to hold all 4 slices in a single layer. Pour egg mixture evenly over the bread slices and let stand for 2 minutes, then turn and coat the other side. The bread should be soft and soaked through but not soggy. Drain off any extra egg mixture. Lightly coat the bottom of a large nonstick skillet with nonstick cooking spray and warm over medium heat. When the pan is hot, add the bread slices. Cook for 2–3 minutes on each side until golden brown and the center springs back when gently pressed. Serve immediately with warm strawberry sauce and garnish with mint. Nutritional information per serving (1 slice plus 1/4 cup sauce): 310 calories, 17 percent fat (6 grams), 69 percent carbohydrate, 14 percent protein, 3.2 grams fiber, 3 milligrams iron, 123 milligrams calcium, 50 micrograms folate. Preheat oven to 350° F. Combine graham crackers and pecans in a food processor and process until finely ground; wash food processor so it is ready to be used again. Line the bottoms of 6 4-ounce ramekins with circles of parchment paper. Press 2 tablespoons graham cracker mixture into an even layer in each ramekin; set aside. Place cottage cheese in a strainer and let drain, shaking occasionally to remove excess liquid. Transfer to the food processor and process until completely smooth. Add sugar and process for 30 seconds. Add mascarpone cheese and lemon juice and process until smooth. Add eggs and vanilla and process until velvety smooth and thick. Spoon cheese mixture into the prepared ramekins, filling to within 1/4 inch of the rims. Place filled ramekins in a 2-inch-deep baking dish. Pour about 1 1/2 inches of boiling water into the baking dish, being careful not to get any in the cheesecakes. Bake for 45 minutes or until the centers are firm to the touch. Remove from oven and let cool completely. To unmold, heat a thin knife under hot water and run between the edge of the cheesecake and the ramekin. Place an individual dessert plate over the top and invert, tapping lightly on the bottom. Remove ramekin and gently peel off the parchment paper from the graham cracker crust. Chill for at least 1 hour (up to 24 hours) before serving. Garnish with fresh mint and a curl of lemon zest. 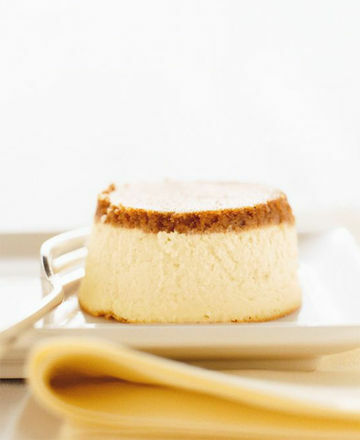 Nutritional information per serving (1 cheesecake): 337 calories, 41 percent fat (15 grams), 41 percent carbohydrate, 18 percent protein, .5 gram fiber, 1 milligram iron, 96 milligrams calcium, 26 micrograms folate. Preheat oven to 350 F. In a large mixing bowl, stir together flour, cocoa powder, baking soda and salt; set aside. Melt chocolate and butter in the top of a double boiler, stirring constantly. When mixture is just melted, remove top pan. Using a wooden spoon, stir in sugar, brown sugar and orange extract. Add eggs; mix until sugar is dissolved and mixture is very smooth. Combine chocolate and flour mixture; mix until smooth. Lightly spray the sides and bottom of a nonstick 8-by-8-inch baking pan with nonstick cooking spray. Pour in the batter, spreading evenly. Cook for 25 minutes or until a toothpick inserted in the center comes out almost clean. Let cool completely in the pan and cut into 9 squares. Nutritional information per serving (1 brownie): 186 calories, 35 percent fat (7 grams), 59 percent carbohydrate, 6 percent protein, 1 gram fiber, 1 milligram iron, 16 milligrams calcium, 8 micrograms folate.